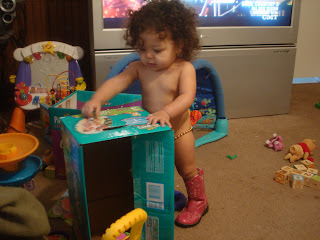 Momma's Time Out: Playing Dress Up? Wendy (one of our favorite people in the world) sent us a box of outgrown clothes for Miss Zoe. In it were a pair of pink cowgirl boots. They are too big for Zoe, but that does not keep her from putting them on. She also hates wearing her diaper these days and will rip it off at any opportunity she sees. On this particular morning, I was cooking breakfast and looked up to find this naked cowgirl in my living room.